Dadsonite: Mineral information, data and localities. Named in 1969 by John Leslie Jambor in honor of Canadian mineralogist, Alexander Stewart Dadson [1906 Canada - 1958 Canada]. A Cl-free homeotype is disulfodadsonite. 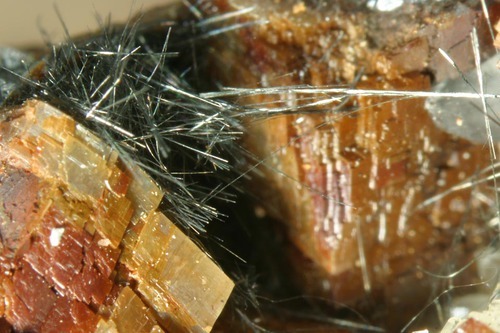 Rare example of lead chlorosulfoantimonite. Chemically related to ardaite; compare also 'UM1980-08-S:ClPbSb', 'UM1980-09-S:ClPbSb', and 'UM1980-10-S:ClPbSb'. Originally assumed to be monoclinic, with a = 19.041, b = 8.226, c = 17.327 A, beta = 96.30°. Desymmetrized OD structure with profuse twinning. Siderite 10 photos of Dadsonite associated with Siderite on mindat.org. Chalcostibite 4 photos of Dadsonite associated with Chalcostibite on mindat.org. Zinkenite 4 photos of Dadsonite associated with Zinkenite on mindat.org. Boulangerite 3 photos of Dadsonite associated with Boulangerite on mindat.org. Bindheimite 3 photos of Dadsonite associated with Bindheimite on mindat.org. Quartz 1 photo of Dadsonite associated with Quartz on mindat.org. Calcite 1 photo of Dadsonite associated with Calcite on mindat.org. COLEMAN, L.C. (1953): Mineralogy of the Yellowknife Bay are, N.W.T. American Mineralogist 38, 506-527. JAMBOR, J.L. (1967a): New lead sulfantimonides from Madoc, Ontario. 1. Canadian Mineralogist 9, 7-24. JAMBOR, J.L. (1967b): New lead sulfantimonides from Madoc, Ontario. 2. Mineral descriptions. Canadian Mineralogist 9, 191-213. JAMBOR, J.L. (1969): Dadsonite (minerals Q and QM), a new lead sulphantimonide. Mineralogical Magazine 37, 437-441. Cervelle, B., Cesbron, F., Sichère, M. C., & Dietrich, J. (1979). La chalcostibite et la dadsonite de Saint-Pons, Alpes de Haute-Provence, France. Canadian Mineralogist, 17, 601-605. Moëlo, Y. (1979). Quaternary compounds in the system Pb-Sb-S-Cl: dadsonite and synthetic phases. Canadian Mineralogist, 17, 595-600. MAKOVICKY, E., MUMME, W.G. & NORRESTAM, R. (1984): The crystal structures of izoklakeite, dadsonite, and jaskolskiite. Acta Crystallographica A40, Supplement, C-246 (abstr.). Mackovicky, E., Topa, D., & Mumme, W. G. (2006). The crystal structure of dadsonite. The Canadian Mineralogist, 44, 1499-1512. Moëlo, Y., Mackovicky, E., Mozgova, N. N., Jambor, J. L., Cook, N., Pring, A., Paar, W., Nickel, E. H., Graeser, S., Karup-Møller, S., Balic-Žunic, T., Mumme, W. G., Vurro, F., Topa, D., Bindi, L., Bente, K., & Shimizu, M. (2008). Sulfosalt systematics: a review. Report of the sulfosalt-subcommittee of the IMA Commission on Ore Mineralogy. European Journal of Mineralogy, 20, 7-46. Kaden, R., Wagner, G., Bente, K. (2012): Crystal chemistry and electrical conductivity of boulangerite, dadsonite and iodine-substituted pillaite grown by chemical vapor transport. Canadian Mineralogist, 50, 219-233. COLEMAN, L.C. (1953): Mineralogy of the Yellowknife Bay are, N.W.T. American Mineralogist 38, 506-527. JAMBOR, J.L. (1967a): New lead sulfantimonides from Madoc, Ontario. 1. Canadian Mineralogist 9, 7-24. JAMBOR, J.L. (1967b): New lead sulfantimonides from Madoc, Ontario. 2. Mineral descriptions. Canadian Mineralogist 9, 191-213. JAMBOR, J.L. (1968): New lead sulfantimonides from Madoc, Ontario. 3. Syntheses, paragenesis, origin. Canadian Mineralogist 10, 507-521. JAMBOR, J.L. (1969): Dadsonite (minerals Q and QM), a new lead sulphantimonide. Mineralogical Magazine 37, 437-441. JAMBOR, J.L. (1967a): New lead sulfantimonides from Madoc, Ontario. 1. Canadian Mineralogist 9, 7-24. JAMBOR, J.L. (1967b): New lead sulfantimonides from Madoc, Ontario. 2. Mineral descriptions. Canadian Mineralogist 9, 191-213. JAMBOR, J.L. (1968): New lead sulfantimonides from Madoc, Ontario. 3. Syntheses, paragenesis, origin. Canadian Mineralogist 10, 507-521. JAMBOR, J.L. 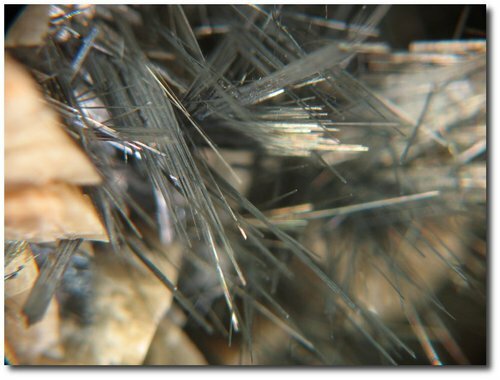 (1969): Dadsonite (minerals Q and QM), a new lead sulphantimonide. Mineralogical Magazine 37, 437-441. Schnorrer, G. & Breitenbach, H. (1996): Lavrion: Neufunde aus dem antiken Bergbau und in historischen Schlacken. Lapis, 21 (1), 45-48; 62. Hanke, H. (1998): Laurion - ein Rückblick auf die Funde der letzten drei Jahre. Mineralien-Welt, 9 (2), 37-45. Orlandi P., 2003. Buca della Vena: i solfosali aciculari di piombo e antimonio (Alpi Apuane, Toscana, Italia). Riv. Miner. Ital., 4: 224-229; Orlandi, P., Moëlo, Y. & Biagioni, C. (2010). Lead-antimony sulfosalts from Tuscany (Italy). X. Dadsonite from the Buca della Vena mine and Bi-rich izoklakeite from the Seravezza marble quarries. Periodico di Mineralogia, 79, 113-121. Sejkora J. & Kouřimský J., 2005: Atlas minerálů České a Slovenské republiky. Academia, Praha, 375 p.
Mackovicky, E., Topa, D., & Mumme, W. G. (2006). The crystal structure of dadsonite. The Canadian Mineralogist, 44, 1499-1512. ; Topa, D., Sejkora, J., Makovicky, E., Pršek, J., Ozdín, D., Putz, H., Dittrich, H. & Karup-Møller, S. (2012): Chovanite, Pb15-2xSb14+2xS36Ox (x ~ 0.2), a new sulphosalt species from the Low Tatra Mountains, Western Carpathians, Slovakia. European Journal of Mineralogy, 24, 727-740. JAMBOR, J.L. (1967b): New lead sulfantimonides from Madoc, Ontario. 2. Mineral descriptions. Canadian Mineralogist 9, 191-213. JAMBOR, J.L. 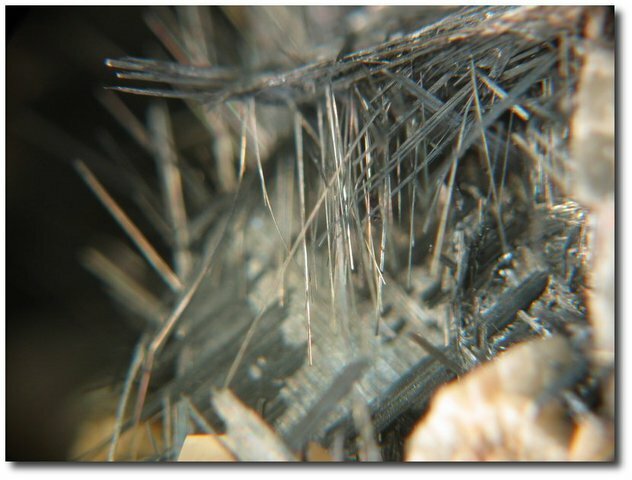 (1969): Dadsonite (minerals Q and QM), a new lead sulphantimonide. Mineralogical Magazine 37, 437-441. Berry et al. (1952) Am. Min. 37, 438.